While Four Seasons Sunrooms is famous for offering great sunroom additions, we offer many other products that allow you to better enjoy your patio and the exterior of your home. That includes pergola deck additions. Your number one source for a sunroom addition is also the place to go for pergola builders in Harrisburg. A pergola is a structure that covers a garden, gateway, patio or deck. 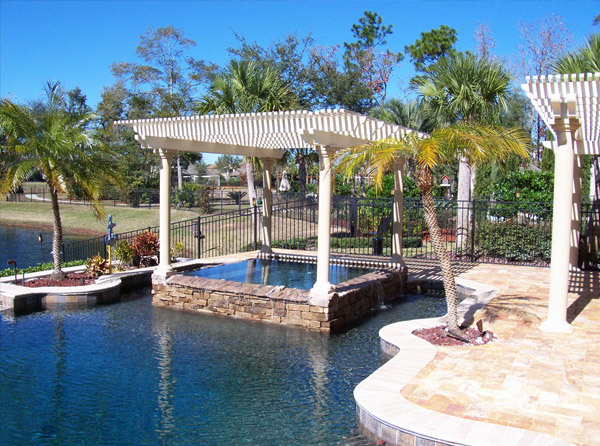 They add an attractive architectural element to your landscape and provide some shade and protection from the elements. Four Seasons Sunrooms feature Elitewood™ Pergolas. 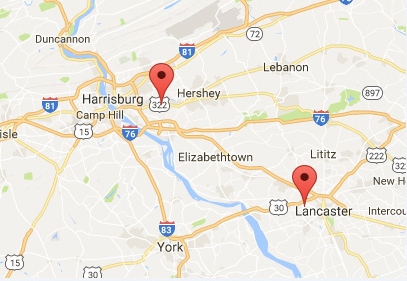 These are some of the most finely constructed pergolas you are likely to find in Central PA or anywhere else. While they are traditionally made of wood, natural wood can create a myriad of problems. The structure may look beautiful, but is easily weathered by the elements and outdoor hazards. Instead of a wood pergola, let us build you an Elitewood™ aluminum pergola with a natural wood grain finish. These pergolas will provide you with that great natural wood look and even feel that you want, but because there is sturdy, durable aluminum underneath, there is no cracking, splitting, warping or wearing down due to bad weather. Unlike real wood, these pergolas are fire-resistant, insect-resistant, and rot-resistant. They will last for years with little to no maintenance. Let us take care of the installation – and then sit back and enjoy! Choose a free-standing pergola to set up over a garden, pathway or any suitable location in your backyard, or an attached one which extends right from your home. The choice is yours based on your budget, lifestyle, and your existing backyard landscaping. Each and every component of our Four Seasons’ Elitewood™ Pergola has been engineered to assemble with flawless fit and finish. Every design has been carefully considered to enhance aesthetic appeal and natural wood appearance. 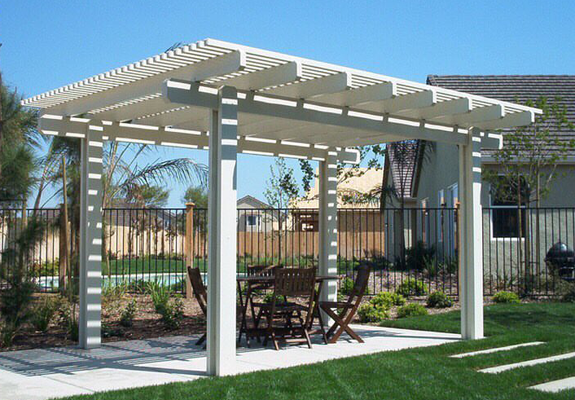 A Four Seasons Elitewood™ Pergola offers comfort with little to no maintenance, total weather resistant, no cracking, warping or splitting, no need for painting, fire resistant, termite resistant and unsurpassed durability that will preserve its beauty for years to come. Every design detail has been carefully considered to enhance the aesthetic appeal and wood appearance without the many issues associated with wood. We take as much care in installing pergolas for your home as we do with our fantastic sunrooms. Our goal is to help you enjoy your home and your home’s exterior and relationship to the outdoors as much as possible. For many, one of our low-maintenance Elitewood™ pergolas is the perfect way to do that. To begin the process of having an Elitewood™ Pergola of your very own, fill out the simple online form and submit it. 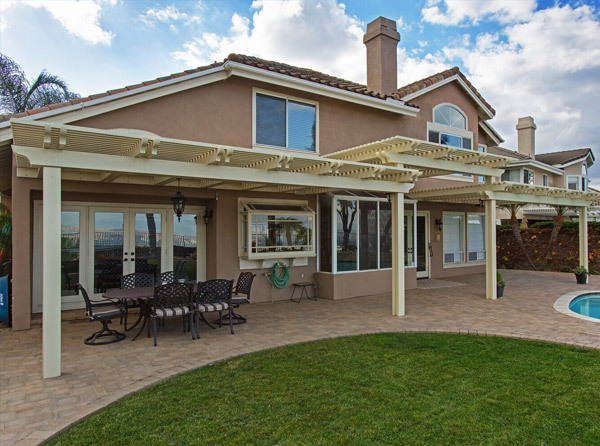 We’ll schedule a time for one of our professionals to come by for a consultation to assess the best way to add your pergola. If you prefer, you can always give us a call at 717-564-2244. We look forward to hearing from you!